In this ask a nutritionist segment Kevin Glaubius, Director of Nutrition, helps answer questions about getting the heifers in our showstring bred. 1. When should my heifer be coming into heat? Show heifers often reach puberty as early as 8-9 months of age as they are generally on a high plane of nutrition. Cycling should continue every three weeks as long as she is healthy and on a steady or increasing plane of nutrition until she is bred. If you plan to calve your heifer at the same time she was born then you will have to wait to breed your heifer until she is roughly 15 months old. You can find many calving date calculators online to help you plan breeding dates. It is also advantageous to write observed heat cycles down on a calendar so you know when she should be cycling next for planning purposes. Example: For a January 1 born heifer to calve on her second birthday you would need to breed on roughly March 25. 2. It is always so hot when we bred, how can I make sure my heifer will stick? The first solution is to plan breeding when you buy or select your heifer. In the example above an older heifer should be bred before the heat sets in for the summer. Heifers generally do continue to cycle in the summer months, but observing standing heat becomes much more difficult, as estrus will often last for a shorter duration or at night in hot weather. It is very important to observe show heifers in heat every couple of hours since knowing when she is first standing in heat will help you determine the best time to breed. Once bred be careful not to stress her further by changing pen mates or major changes to routine. This is because the first 7-10 days are very important for a successful pregnancy. The second solution is to keep your heifer on an increasing plane of nutrition during this period. It doesn’t work well to get her too fat prior to breeding and then be restricting energy and protein intake during the breeding period from a biological standpoint. Wait until she is confirmed pregnant before placing on a holding ration and lowering body fat. Finally, make sure you are using a breeding mineral like VitaFerm® Concept Aid with the AMAFERM® Advantage. VitaFerm® Concept Aid is specifically designed from a vitamin and mineral standpoint to ensure breeding success. Also, your heifers will benefit from the AMAFERM® Advantage as AMAFERM® helps to lower body temperature, which will aid in helping get your heifer bred. 3. 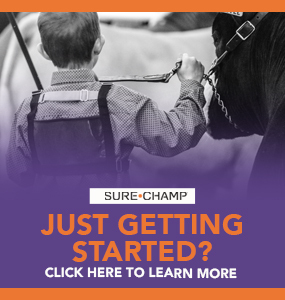 If I am feeding Sure Champ® do I need to feed VitaFerm® Concept Aid? Sure Champ® and VitaFerm Concept-Aid both contain the AMAFERM® Advantage. 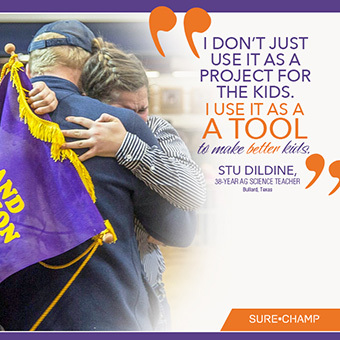 If you do not need the additional protein in Sure Champ I would recommend VitaFerm® Concept Aid. 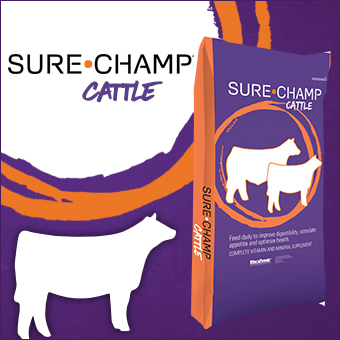 If you use Sure Champ® as your only protein source then I would feed both together for maximum breeding results. It is important to have heifer on a mineral program (whether that be Sure Champ® or VitaFerm® Concept Aid) at least 60 days before breeding. 4. Some people say that if I get my heifer too fat she won’t breed, however I need to make sure she has enough condition for the showring. This is true and I have seen it many times. Estrus is related to hormonal changes and hormones are fat-soluble. As a heifer becomes fatter is will be harder to detect standing heat especially as we move into the warmer months. It is very common in feedlots for heifers to be cycling and riding like crazy the first 100 days on feed. After that you rarely see them cycling once they are 1,000 lbs., and in good shape. We can apply this knowledge to show heifers. This is why it pays to spend a lot of time planning what age heifer to show. If breeding is your goal then buy an older heifer in moderate condition and breed her as soon as possible to hit your target calving date. If you have to push a younger heifer hard you may increase the risk of not getting her bred. To ask our nutritionists a question or to read more of the nutrition questions that have been submitted click here. 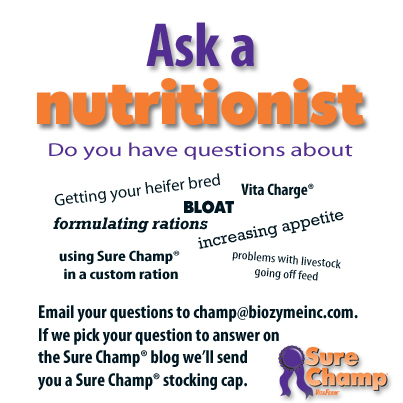 Junior Spotlight: John ReasorAsk a Nutritionist: How should we formulate a show heifer ration?